Hearing some rumors that the company Merck is having a major virus outbreak with something new and their Europe networks are affected more than their US offices. Have you heard anything on this? 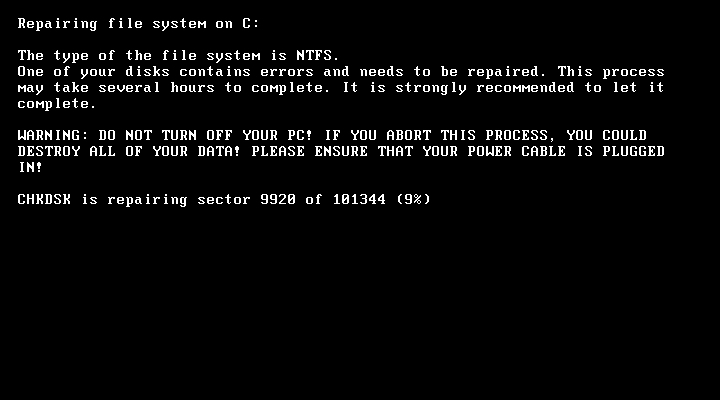 A quick check reveals that, apparently, another global ransomware attack is making the rounds today. Initial reports indicate this is much like last month's WannaCry attack. 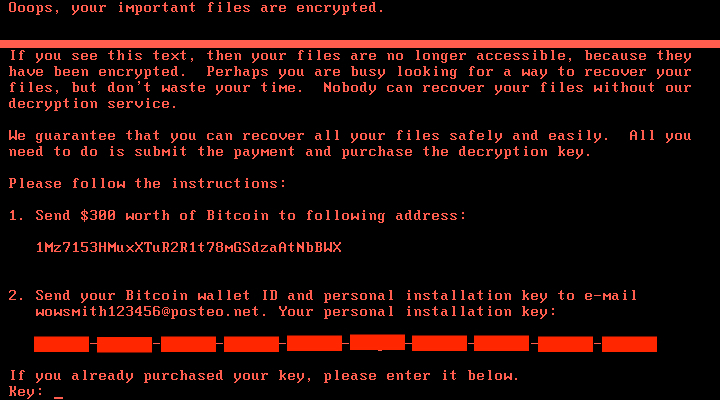 According to the Verge article, today's ransomware appears to be a new Petya variant called Petyawrap. 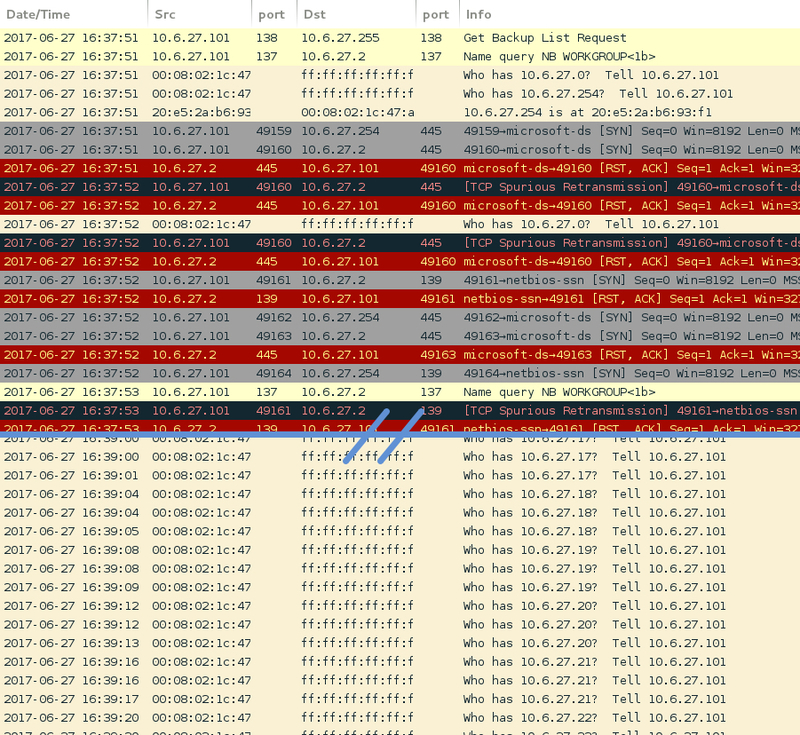 At this point, we see plenty of speculation on how the ransomware is spreading (everything from email to an EternalBlue-style SMB exploit), but nothing has been confirmed yet for the initial infection vector. We'll provide more information as it becomes available. Has anyone read A Tale of Two Cities, the 1859 novel by Charles Dickens? Or maybe seen one of the movie adaptations of it? It's set during the French Revolution, including the Reign of Terror, where revolutionary leaders used violence as an instrument of the government. In the previous sentence, substitute "violence" with "email." Then substitute "government" with "criminals." Now what do you have? Email being used as an instrument of the criminals! I know, I know... No real ties to Dickens' novel here. A pun for the title is, quite literarily, the best I could do. Shown above: That's all I got--a somewhat clever title for this diary. 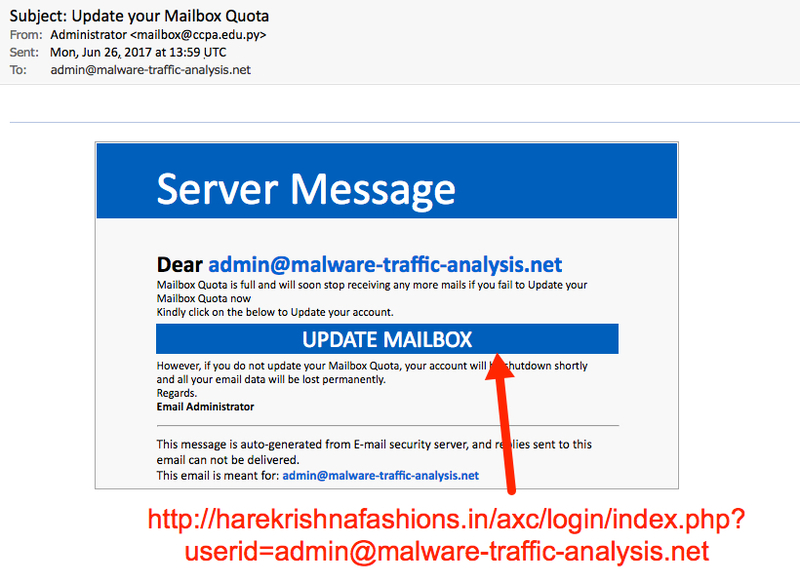 This diary briefly investigates two phishing emails. 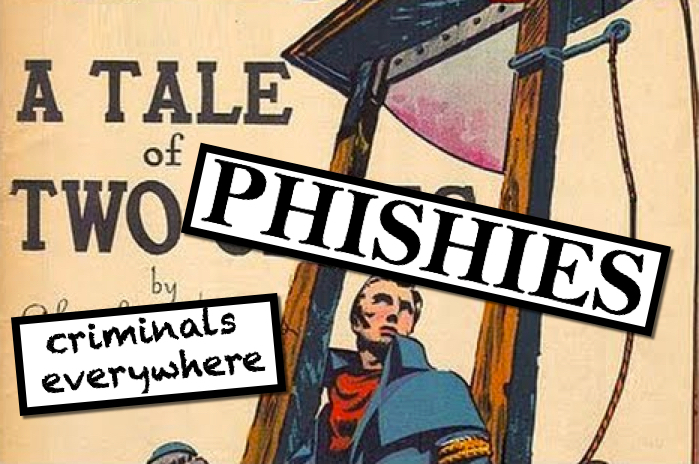 It's a "Tale of Two Phishies" I ran across on Monday 2017-06-26. The first example went to my blog's admin email address. 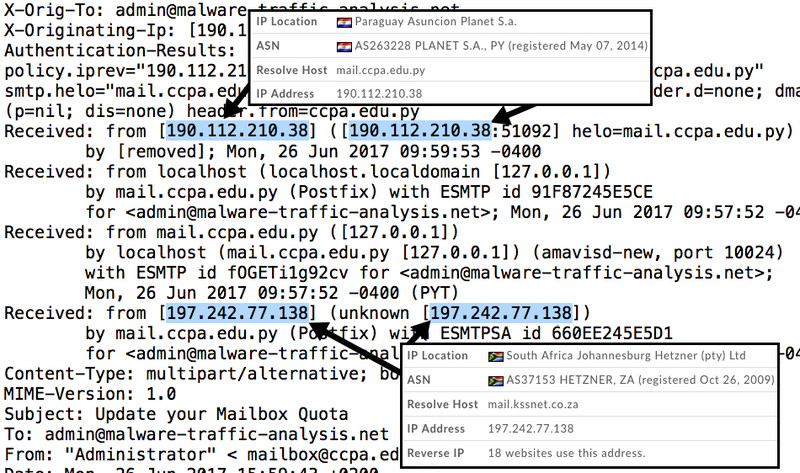 It came from the mail server of an educational institution in Paraguay, possibly used as a relay from an IP address in South Africa. For email headers, you can only rely on the "Received:" header right before the message hits your mail server. Anything before that can be spoofed. It's a pretty poor attempt, because this phishing message is very generic. I'm educated enough to realize this didn't come from my email provider. And the login page was obviously fake. Unfortunately, some people might actually be fooled by this. The compromised website hosting a fake login page was quickly taken off line. You won't be able to replicate the traffic by the time you read this. It's already been submitted to PhishTank. Shown above: The first phishing email. Shown above: Email headers from the first phishing email. 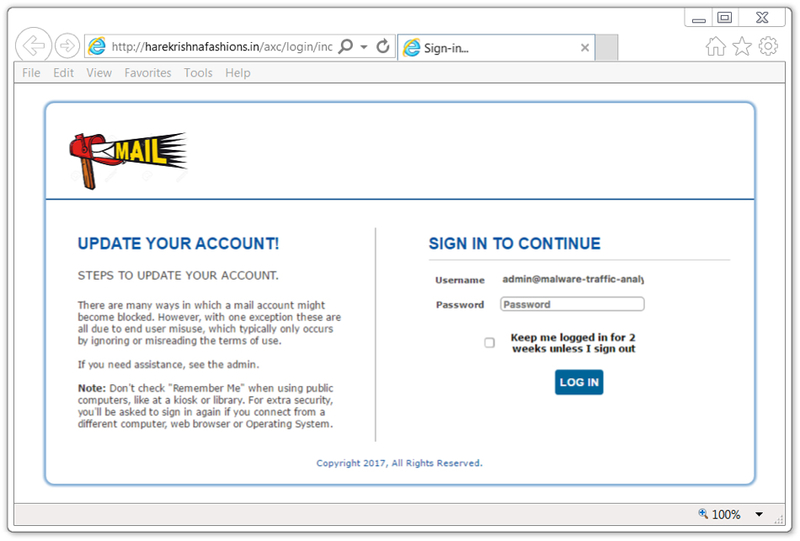 Shown above: The fake login page from link in the phishing email. Every time I see a phishing message like this second example, I hope there's malware involved. But in this case, the email has a PDF attachment with a link to a fake Adobe login page. Shown above: The second phishing email. Examining the PDF attachment, I quickly realized the criminals had made a mistake. They forgot to put .com at the end of the domain name in the URL from the PDF file. lillyforklifts should be lillyforklifts.com. I'd checked the URL early Monday morning with .com at the end of the domain name, and it worked. When I later checked again for this diary, it had already been taken down. 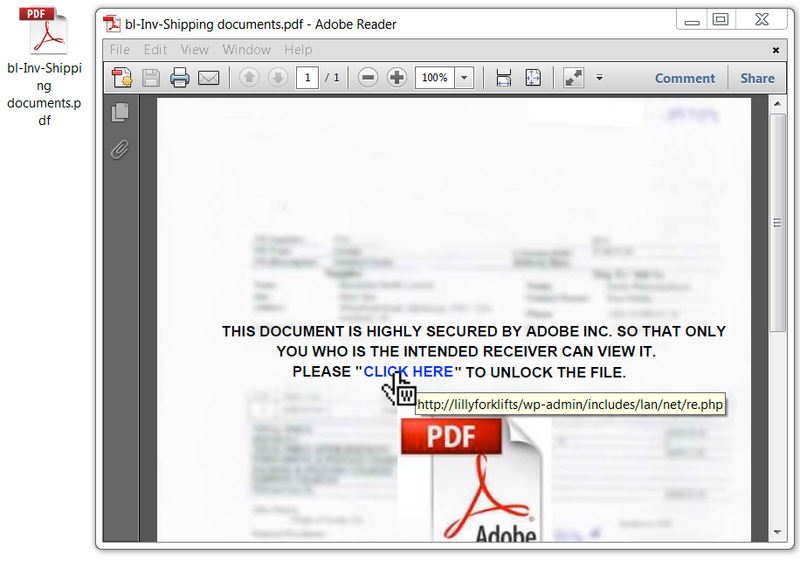 Shown above: PDF attachment from the second phishing email. These types of phishes are what I call an "elephant in the room." That's an English-language metaphor. "Elephant in the room" represents an obvious issue that no one discusses or challenges. These types of phishing emails are very much an elephant in the room for a lot of security professionals. Why? Because we see far more serious issues during day-to-day operations in our networks. Many people (including me) feel we have better things to worry about. But these types of phishing emails are constantly sent. They represent an on-going threat, however small they might be in comparison to other issues. Messages with fake login pages for Netflix, Apple, email accounts, banks, and other organizations occur on a daily basis. For example, on Phishtank.com, the stats page indicates an average of 1,000 to 1,500 unique URLs were submitted on a daily basis during the past month. Stats for specific months show 58,556 unique URLs submitted in May 2017 alone. Fortunately, various individuals on Twitter occasionally tweet about the fake login pages they find. Of course, many people also notify sites like PhishTank, scumware.org, and many other resources to fight this never-ending battle. So today, it's open discussion on these phishing emails. Do you know anyone that's been fooled by these messages? Are there any good resources covering these phishing emails I forgot to mention? If so, please share your stories or information in the comments section below.